1. Get more training. I’ve always noticed how Al, Ernie, and some of the other more experienced guys I ride with go around curves much more smoothly than I do. They rarely need to brake or downshift and seem a lot better at picking their lines and ripping through them. In 2011, when I started riding with Art and his group, I became even more aware of my limitations. I’m going to do something about it in 2012. First, I plan to take the Motorcycle Safety Foundation’s Experienced Rider Course when they start back up in the Spring. Second, I’m going to take a class at Keith Code’s Superbike School. They offer it in South Jersey, not far from where I live, it’s reasonably priced, and includes use of a BMW S1000RR. Not bad! 2. Go ATGATT. I’ve written about this a couple times already – the importance of riding with All The Gear, All The Time. My 2012 resolution is to do it for real. 3. Get a second bike. I’ve also written about this recently. 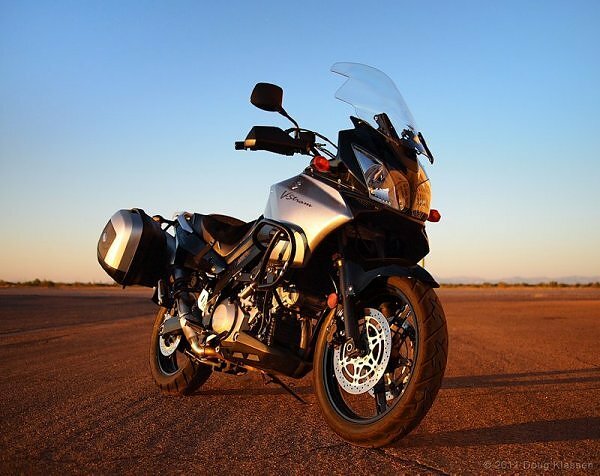 Front runner is a Suzuki V-Strom 650. I’d like to find a 2007 or newer Strom with a top box, preferably ABS, and under 20k miles in the $5k range as my daily commuter/occasionally off-road bike and lightweight, low-maintenance complement to my Rocket III Touring. 4. Go off road. I want to get a chance to ride on some dirt this year. I haven’t done it since I was 10 years old and my ride was a Rupp Scrambler with a Tecumseh lawnmower engine. I may look for an off-road class to take as well. 5. Keep up with this blog. This blog started as a skunkworks project to experiment with social media tools in support of my public relations practice. But shortly after starting it, I learned that it’s a great creative outlet for me to do two things I absolutely love to do: write and talk about motorcycles. Yesterday I crossed 1,000 page views – small by media standards but way WAY more than I expected at this stage of the game. I’ve got a lot of good ideas for blog posts in 2012 and my editorial calendar is starting to fill up. Stay tuned for more. Do you have any motorcycle-related New Years Resolutions? Share them with me in the comments section, and I’ll pick one of the comments at random to receive two free tickets to the Progressive International Motorcycle Show in New York City, January 20-22, 2012. Its been my dream to do a Super Bike School but maybe a more realistic goal would be to do the experienced riding course…..
First, to see my vintage CB build through to completion – a nut & bolt restoration/cafe inspired conversion currently approaching the final assembly stage. Second, to ensure my longtime friend and partner in this build knows how much I appreciate the passion, dedication and hard work he’s poured into my motorcycle. Besides the countless thanks he has and will receive I look forward to riding my new machine with him at every opportunity, getting his beautiful creation as much exposure as possible, and supporting him in future builds. Motorcycles are about more than the isolation of the open road – for me they’re about the people and friendships along the way. This bike build has been a reminder of what good friends, some hard work and a love of vintage bikes can accomplish. Check the link below for a sneak peek of the project & keep a look out for a complete build sheet and finished glamor shots of the bike in the near future.